sardines which are typically stuffed. blossoms, which cooks stuff), potatoes, onions, and artichokes are some of the most common vegetables grown. terraces. Forested hills grow wild with pine trees providing the pine nuts for many Ligurian dishes. is important to the cuisine; almost every pasta dish in Liguria is served with a final sprinkling of good olive oil. Trenette is a flat ribbon pasta that is a specialty of Liguria. 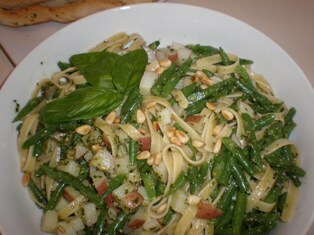 It is similar to linguine or tagliatelle. Since finding trenette pasta can be difficult outside of Liguria, linguine, tagliatelle, or fettuccine are very good substitutes. For an even lighter lunch dish, you may choose to use capellini (angel hair pasta). Trofie (TROH-fee-eh) is a pasta shape that is unique to the region of Liguria. 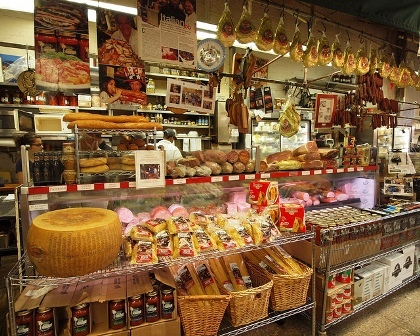 The hand-rolled pasta is made from pieces of dough that are twisted to look like spirals with pointed ends. The dough for this pasta is simply made with flour, salt, and water - and no eggs; sometimes the dough is made with semolina flour. Ligurians take full advantage of fresh herbs in their pasta and sauces. 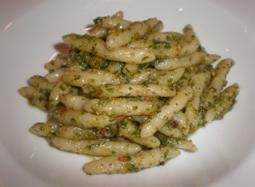 The sauce that Liguria is most famous for is Pesto alla Genovese. This shimmering green sauce is all about one herb, basil. It is a spicy green paste of basil, olive oil, garlic, pine nuts, and cheese. All the ingredients are combined in the right proportions to bring out the maximum flavor and aroma of the fresh pesto; a perfume to the Ligurian nose and palate. Opinions on the correct ingredients and methods in making pesto are many and varied. 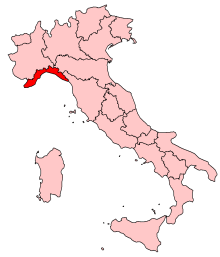 Salsa di noci is another sauce that is very popular in Liguria. Salsa di noci, made with walnuts, pine nuts, garlic, butter, and cream is almost as much of a favorite in Liguria as the pesto made with basil. This walnut sauce is commonly served with pansoti (Ligurian ravioli) but it also pairs well with ribbon pasta, such as trenette. Blanch the walnuts and remove their skins. Put the walnuts, pine nuts, and garlic in a food processor. Pulse until the ingredients are finely chopped but not pureed. Transfer the mixture to a bowl. Stir in the cream; season with salt and pepper. Pour the sauce over the pasta. Add the Parmesan cheese and butter. Toss the pasta gently to coat with the sauce. The taggiasca (pronounced tahg-gee-ahs-ka) olive is the main variety of olive grown in Liguria on the rocky mountain slopes of the Italian Riveria. This small, Italian olive is sweet and mild with a distinct deep red coloring. 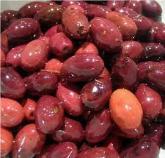 The olives can vary in color from blond to deep red, violet, or brown. Taggiasca olives yield a light, fine oil with a delicate almond flavor. The buttery oil enhances the flavor of delicate ingredients like seafood or vegetables, without overpowering their taste. For eating, the olives are cured in a sea salt brine or oil. The olive itself has very little flesh and has a firm bite. 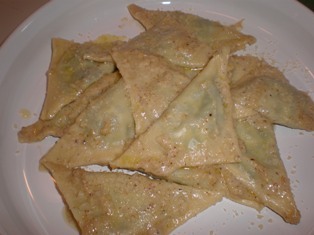 Pansotti are triangular-shaped ravioli from Liguria. The dough for pansotti is usually flavored with white wine. The filling is made with cheese and a mixture of different kinds of herbs and greens called preboggion. The filling ingredients can vary. Pansott are traditionally served with Salsa di Noci, a walnut cream sauce but they are also good with a traditional tomato sauce. Put the flour, salt, egg, and olive oil in the food processor bowl. Pulse to combine. Add only enough wine to make the dough come together. Remove the dough from the food processor bowl. Knead the dough with your hands until it is smooth. Cover and let rest for 10-15 minutes. In a large sauté pan over medium heat, warm the olive oil. Add the greens, basil, and garlic; season with salt and pepper. Sauté until the greens are wilted; transfer to a plate and allow to cool. When the greens are cool, pulse the mixture in a food processor to finely chop. Place the mixture in a large mixing bowl. Add the Parmesan, ricotta, egg, and nutmeg; stir until blended. Divide the dough into quarters; run each piece through a pasta machine to make long strips. Cut the strips of dough into 3-inch squares. Place a heaping teaspoon of filling in the center of each square. Fold the dough over the filling to create a triangle shape. Seal the edges well. Place the pansotti on a lightly floured surface as you complete forming the remainder. Cook the pansotti in boiling salted water until al dente. Drain with a slotted spoon and toss them with walnut sauce or your desired sauce. Serve hot and pass grated Parmesan cheese to sprinkle on top. Croxetti (also called corzetti) are small, thin coin-shaped disks of embossed pasta that are about 2 inches in diameter. The embossed decoration is created by using a special wooden hand-tool or by machine. The embossing is not only decorative but it also serves to hold the sauce on the pasta. Croxetti originated in the Middle Ages, when cooks of noble Ligurian families would press a thin sheet of pasta between two wooden molds engraved with the family's coat of arms on one side. Quite often the symbol stamped on the second side was the Christian cross, thereby giving the pasta its name. 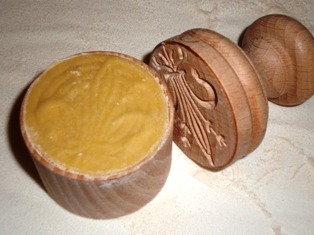 In Italy, croxetti may be used as wedding favors or for other events, in which case an artisan craftsman is commissioned to create a design of significance to the occasion. Croxetti is usually served with a simple meat or mushroom sauce, pesto, walnut sauce, or a light cream sauce. 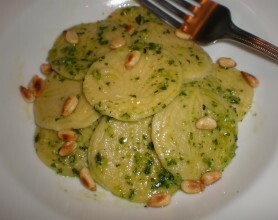 They may also be served with a butter sauce flavored with herbs. thick sheets, about #5 on a pasta machine. cutter on the underside of the corzetti stamp. presser top of the corzetti stamp with flour. 5. Place the top of the stamp (the one with the handle) on top of the dough circle and press down firmly to emboss the image. 6. Remove the top and gently loosen the dough from the base. Transfer the embossed circles to a lightly floured surface or tray. Allow the corzetti to dry for 1-2 hours. 7. Cook the corzetti in boiling salted water until al dente, about 3 minutes. 8. Serve with pesto and toasted pine nuts, sage and brown butter, or your favorite sauce. NOTE: You need to roll the dough sheets thicker than you would for regular pasta in order for the design to be embossed and for the circle to release easily from the stamp. Born and raised in Torino, Italy, Laura Giannatempo spent most summers growing up at her family's seaside house in Liguria. Here she developed a passion for the region's vibrant food. With 100 delicious recipes and a beautiful selection of color photographs, Giannatempo takes you on a spirited gastronomic journey through "that extraordinary marriage of land and sea that is Ligurian cuisine." The pine nut is actually the tiny, cream-colored seed of a certain species of pine tree. Pine nuts , sold shelled, raw or roasted, have a rich buttery flavor and add a nice crunch to many foods, included baked goods, pasta, and salads.